Why travel when we can come to you! Let’s face it – training, while it has a very positive long term impact, is an investment in time and money in the short term. In most cases, a significant cost of training is travel expense. It is not often that a training of interest happens to be in your local area. Travel costs such as airline tickets, hotel rooms, car rentals, and meals can run well over $2000 per person per week. Travel also takes a bite out of productivity due to the downtime when traveling. There is a limited amount of productivity one can expect when traveling or after a long day of sitting in a training session. The issue becomes more complex when an entire group of designers and engineers needs training. Do you do send all of them all at once to ramp up their skills while dropping productivity to zero? Do you send them out in a piecemeal fashion in the hopes that the training will be provided again in the near future? Can you clear their schedules so that they can take an on-line course without having the training derailed with e-mails, phone calls, visitors, and other distractions of the office? Is the public training covering topics that are relevant to the company's needs? Colin O'Flynn - CTO, NewAE Technology Inc.
At Nine Dot Connects, we teach where there’s a need. 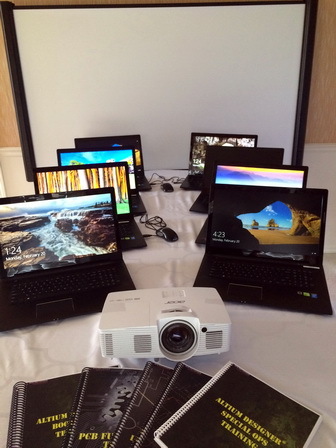 We are not tethered to any for-hire computer classrooms because we own and use our equipment to deliver our training. Therefore, when it comes to onsite training, we can provide you and your company the same quality training that we provide in a public in-class or online setting. We can work with you to select an optimal schedule that fits your needs. With our flexibility, we can train directly onsite in your facility, or at any available outside facility local to you. Our instructors are a team of senior electrical engineers who have been conducting ECAD training for many years, and they also have a hands-on experience with product development where they were responsible for the design of working PCBs. In fact, across our team, we have taught over 500 EDA related courses in our accumulative careers. Schedule – You pick the start date - Mon, Tue, Wed, or Thur! Time - Can’t do 9 to 5? Training does not have to be all day. The number of hours and the start time can be set by you. Location – Can’t leave the facility due to the travel downtime? We can come to you and save you the travel hassle and all expenses. Cost - Don't want to bear the travel cost of your employees? The cost is much more effective due to volume discount and no travel cost. Content – Worried that you will waste time on unnecessary content? 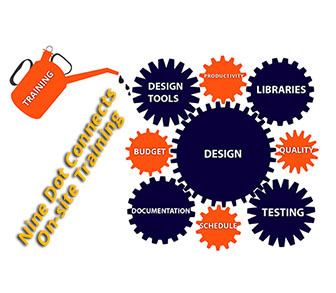 We can customize the training to meet your needs. Equipment – Don’t have laptops that can be spared for training? We have equipment that can be shipped to any location. Quality – Worried about the level of excellence in the instruction and/or instructors? Our instructors have worked extensively as engineers prior to becoming instructors. Combined, they have delivered over 500+ classes and thousands of hours highly regarded training. Take a look at some reviews here. On Demand – Just need someone to guide you every so often? We provide a block of consulting hours to be used to allow you to continue to do your work with the assurance that there is someone available to assist when the going gets tough. In short, training needs to be pertinent to your time and needs. We at Nine Dot Connects can provide this flexibility. We had three days of some of the best training I can remember in my career. Chip handled all questions and maintained a formidable pace that covered a lot of territory and yet made sure no one got left behind. I have received a number of positive comments from the attendees. Things like “I wish I had had this training 3 years ago!” or “spent days trying to figure this out and it can be done on just a few clicks!” All in all it was a very valuable experience. "Dan provided the Altium Designer Boot Camp private onsite training and he is an excellent instructor. He was successful at keeping the entire class engaged and while working through the exercises he worked with us on an individual basis. I thoroughly enjoyed this training class. One of the best classes I have ever attended. My goal for attending the class was to be able to understand how everything fits together and have the ability to incorporate part changes as the product matures. I feel I have a good understanding of the material as it relates to my job function." Dan performed training for 5 people for three days at our facility, and it was absolutely worth it. By the end of the third day, all persons under training were capable of taking a design from a sketch to a PCB layout. The training was absolutely worth every penny, and Dan’s industry knowledge and expertise in PCB design was the key to this success. Thanks for an awesome private training on PCB layout this week. I learned a ton. Now that I’m back, I think I have to pretty much trash a layout that I was working on. I basically designed an un-buildable board. It’s not ALL bad though. I am happy with my component placement and I have a pretty good sense for how routing has to flow for the design. "The PCB Fundamentals class was great for me as an experienced EE, but without experience in PCB design & fabrication. I would recommend the class to anyone interested in learning more about the details of how PCBs are made and the process for getting [that circuit] onto a PCB. Do not be intimidated by the technology, the instructor and this class will educate you no matter your current familiarity with PCB design." "Taking a design from a start to end in the proper order. I took this course from (another provider) a couple of years ago. (it was) taught out of sequence - didn't get around to talking about library parts until day 3. Complete waste of time. Your course was far more valuable." Ken Gott - Development Engineer, Sciton Inc.
"Chip was an outstanding instructor. Deep understanding of and experience with the material, and ability to tailor the course to the skill level of the class made it an enjoyable 3 days. The flow of course material was logical and easy to follow, building on the lessons and days before. Michael Rodzinski - Mechanical Test Systems Engineer, Tesla Motors, Inc.